The Nevada and federal tax laws are ever-changing and something most business owners dread. Allow an expert tax accountant from our CPA firm in Las Vegas to provide you with the necessary information to minimize your tax liability based on the current tax laws. We don’t just do taxes; we offer comprehensive small business financial management to small business owners who want to effectively grow and manage their businesses. We are here year round to discuss issues that may arise based on any changes to your income or tax situation. As an accounting firm, we enjoy working with our clients to provide them with the tools to plan for the future and help them achieve their goals. Don’t hesitate to call us with your questions, as it is more beneficial to plan and be proactive than to try to resolve issues after the fact. From simply adding a new member to your household to starting a new business, we are here to help with every last detail that surfaces. Tax planning is one of the more significant tax services that no family should overlook. Find out more about our CPA firm. Nobody likes to go to the mailbox and find a letter from the IRS, but it happens from time to time. Our tax professionals can assist you through the process and work with the IRS to resolve the situation and keep you out of trouble, and your money in your pocket. Your tax accountant will provide you with the comfort of knowing that someone is looking out for your best interests, and won’t let the IRS bully you around. Some IRS matters are simple and some complex, but having someone to work through the process is key to moving forward. If you owe back taxes to the IRS, our certified public accountants may be able to assist you. Don’t try to deal with the issue by yourself, or worse yet, not do anything about it. When you choose to work with the professionals at Larry L Bertsch, CPA & Associates, we will handle all of your IRS problems for you, and outline the best possible plan in order to resolve the issues quickly. Call us at 702-471-7223, or fill out the form to the right, and we will get working on your case right away, to get rid of your problems with the IRS. For varying reasons, taxpayers will get behind on filing their tax returns. Often, the hardest thing to do is get the ball rolling again. We can help with that. No matter how simple or complicated, we can come up with a plan to file the returns and deal with any amounts due the IRS. The key is to get them submitted so you can lessen the burden of filing late. Besides, if you wait too long, you may lose out on a refund as well, so it’s important to get caught up if you are behind. I received an IRS notice – what do I do? The IRS sends out millions of notices each year to taxpayers. Don’t panic and stay calm. Some letters are routine and can be resolved simply. The best advice is to deal with the notice or letter promptly. The letter or notice will give you specific instructions on how to solve the issue or problem. If you feel you need assistance in addressing the letter or notice, please contact our office, Larry L. Bertsch CPA & Associates. A tax accountant will be happy to assist you. Contrary to horror stories commonly heard, the IRS is interested in working with you to resolve your tax balances. In all honesty, sometimes the process is smooth. Other times, it can be a battle. The are varying degrees of resolutions based on the amount that is owed. We can assist in narrowing down your options and find a solution to get through the challenges of owing the IRS. I’m applying for a loan and need my returns completed. Whether you are purchasing a home or applying for a loan for other reasons, the lender will request your tax returns. If you are not current on your tax filings, you will need to get your tax returns up to date. We understand the importance of having these filings completed timely and will be sensitive to your timeline. Please call the office for an appointment with one of our tax experts. If you are filing bankruptcy, the Bankruptcy Court will require two years of tax returns. It is important to discuss with your bankruptcy attorney the ramifications of any potential tax refund due you. We can work with you at a reasonable cost to help you get your returns caught up for filing. If you can exclude the gain on the sale you don’t have to report the sale on the return. That is the simple, short version. Unfortunately, not everyone can exclude the gain as there are parameters related to the exclusion and if you receive a 1099 related to the sale you probably have to report the transaction on your return whether you owe taxes on the sale or not. Larry L Bertsch CPA & Associates can assist you with the proper reporting of the sale of your primary residence. Please call the office for an appointment. I just bought a rental home and needed help with my taxes. When you have a rental property, you essentially have a business. You can write off those expenses associated with operating the business i.e. mortgage interest, insurance, homeowners association fees etc. If you do have a loss on the rental, there are limitations, so it is important to consult with us to discuss those limitations on how it will affect your taxable income. If you feel the relationship with your current tax accountant is not meeting your needs, it may be time to change. Communication between the tax preparer and client is necessary for the accurate completion of a client’s returns. We pride ourselves on the relationships we have with our customers and encourage our prospective clients to interview with several firms to ensure the right fit. Call the office if you feel we can be of assistance with your tax preparation. What can I deduct on my individual return? Deductions on your personal income tax return certainly vary based on your income and filing status. The most common deductions that allow taxpayers to itemize their deductions are mortgage interest, real estate taxes and charitable contributions. What business expenses can I write off if I am a sole proprietor? As a sole proprietor, business expenses can reduce both your regular income tax as well as self-employment tax. For this reason, you want to make sure you are keeping track of all your business related expenses. To qualify as a business expense, the expense must be “ordinary and necessary” for your business. The IRS has a publication dedicated to business expenses so the list can be extensive. The most important advice is to document, document, document! If you would like to further discuss what you can deduct, Larry L Bertsch, CPA & Associates is here to help. Just give us a call for an appointment with a tax accountant. What are the deductions for my partnership? Deductions for all businesses fall under one IRS definition- ordinary and necessary expenses to produce the income. Costs you incur to make money are deductible against the income earned. What is the difference in taxes for the different entities I can set up? Partnership, Corporation, LLC or Sole Proprietorship are all various forms of business entities. The tax implications for each can be confusing and unfortunately cannot be explained in just a few sentences. Some entities are considered “pass-through” and the income/loss is reported on the owner’s individual tax return. A C Corporation is responsible for its own taxes. It is crucial to understand all the various entities and the issues tax and otherwise associated with each form. Larry L Bertsch, CPA & Associates can go through each business form and discuss the tax implications of each. Does my business pay the taxes? When you have a business earning income, you are going to have to pay taxes. Where you pay the taxes depends on what type of entity you are. At the entity level, only C Corporations pay taxes by themselves. With other entities such as Sole Proprietors, S Corporations, and LLC/Partnerships, the taxes are paid at the individual level- which means you pay them personally on your 1040. 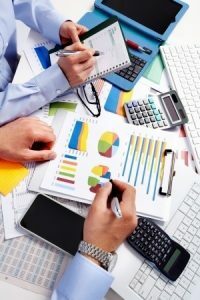 A tax accountant can assist you in further breaking down the differences between each organizational structure for your business and find out what may work best for you. I bought a new house what can I deduct? The following are deductions related to the purchase of a new primary residence: mortgage interest, property taxes, points you paid on the purchase, premiums paid for Private Mortgage Insurance (ending 2013). It is important to mention some of these deductions may disappear based on your Adjusted Gross Income (AGI) so it is important to discuss with a tax advisor. Please call our office and speak with a tax accountant if you have questions related to the purchase of your new home. Need an Experienced Tax Accountant?